We been working on adding more spatial agent based models examples to GeoMason, the GIS extension for MASON. These include a vegetation growth model utilizing raster data and a simple disease outbreak model utilizing vector data. See below for more details. Eastern Africa has undergone sustained drought for over a decade placing a great strain on the local population. This demo introduces an agent-based model of grazing called Turkana South. The model makes use of NDVI data and monthly rainfall data to drive vegetation growth. After describing the model, the paper investigates the effect rainfall has on carrying capacity and how carrying capacity varies based on initial starting conditions. I conclude that carrying capacity is independent of initial population size. This demo introduces a new agent-based model (ABM) for studying the spread of influenza through the schools and households of Fairfax County, VA. It is intended to explore the following questions. How does an epidemic outbreak spread through a school system? What containment approaches might be most effective at stopping an outbreak? To find out more about GeoMason (including the data and source code for these models) click here. 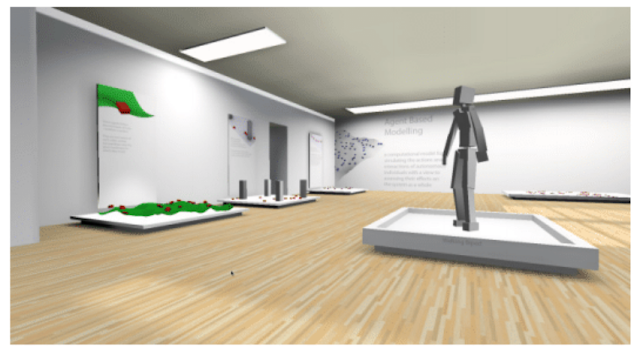 Thanks to Joseph Harrison for sharing these models which where developed for class projects at the Department of Computational Social Science at George Mason University. Project Geppetto from Autodesk attempts to make it it easy, fast, and fun to add crowds to 3ds Max scenes. It is part of Autodesk's "People Power" concept, where the basic idea is to try to assemble all the components one needs to create, manage, and control large crowds of characters. Specificcally it attempts to create believable motion, allow for cultural influences (Evolver) and to create a framework for thousands of characters to interact in. Below are some examples of the project. 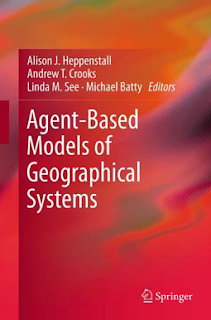 Agent-Based Models of Geographical Systems, is editied by Alison Heppenstall, Andrew Crooks, Linda See and Mike Batty; and brings together a comprehensive set of papers on the background, theory, technical issues and applications of agent-based modelling (ABM) within geographical systems. This collection of papers (see below) is an invaluable reference point for the experienced agent-based modeller as well those new to the area. Specific geographical issues such as handling scale and space are dealt with as well as practical advice from leading experts about designing and creating ABMs, handling complexity, visualising and validating model outputs. With contributions from many of the world’s leading research institutions (see map below), the latest applied research (micro and macro applications) from around the globe exemplify what can be achieved in geographical context. 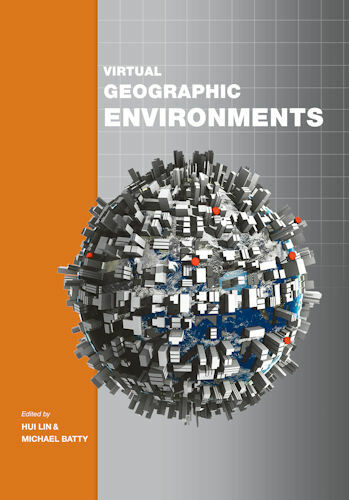 This book is relevant to researchers, postgraduate and advanced undergraduate students, and professionals in the areas of quantitative geography, spatial analysis, spatial modelling, social simulation modelling and geographical information sciences. To see a sample of the book click here. Perspectives on Agent-Based Models and Geographical Systems. A Generic Framework for Computational Spatial Modelling. A Review of Microsimulation and Hybrid Agent Based Approach. Cellular Automata in Urban Spatial Modelling. Part 2: Principles and Concepts of Agent-Based Modelling. Agent-Based Models - Because they're Worth it? Designing and Building an Agent-Based Model. 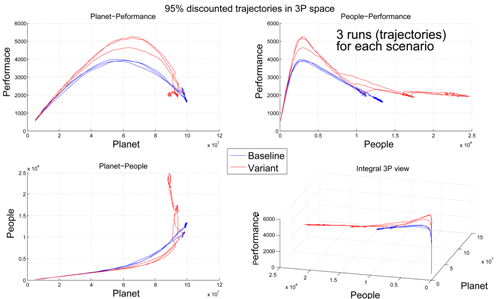 Modelling Human Behaviour in Agent-Based Models. Calibration and Validation of Agent-Based Models of Land Cover Change. Networks in Agent-Based Social Simulation. 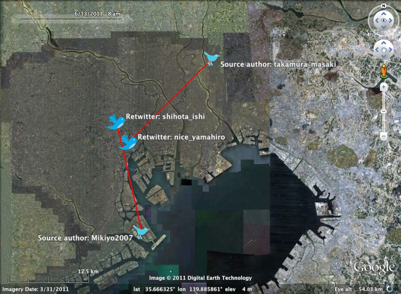 The Integration of Agent-Based Modelling and Geographical Information for Geospatial Simulation. Large Scale Agent-Based Modelling: A Review and Guidelines for Model Scaling. Agent-Based Extensions to a Spatial Microsimulation Model of Demographic Change. Agent Tools Techniques and Methods for Macro and Microscopic Simulation. Using Agent-Based Models to Simulate Crime. Business Applications and Research Questions using Spatial Agent-Based Models. Using Agent-Based Models for Education Planning. Is the UK Education System Agent Based? Do Land Markets Matter? A Modelling Ontology and Experimental Design to Test the Effects of Land Markets for an Agent-Based Model of Ex-urban Residential Land-Use Change. Exploring Coupled Housing and Land Market Interactions Through an Economic Agent-Based Model (CHALMS). 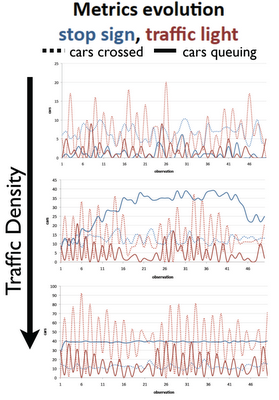 Exploring Urban Dynamics in Latin American Cities using an Agent-Based Simulation Approach. An Agent-Based/Network Approach to Spatial Epidemics. An Agent-Based Modelling Application of Shifting Cultivation. 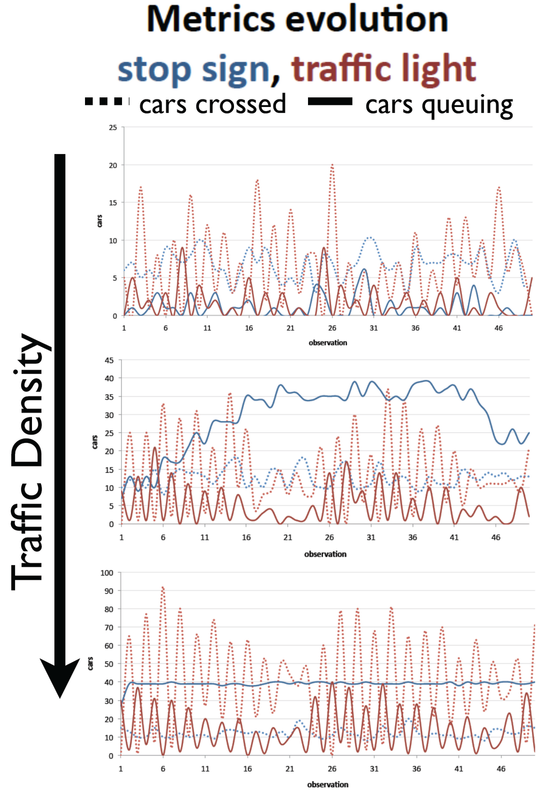 Towards New Metrics for Urban Road Networks. Some Preliminary Evidence from Agent-Based Simulations. A Logistic Based Cellular Automata Model for Continuous Urban Growth Simulation: A Case Study of the Gold Coast City, Australia. Exploring Demographic and Lot Effects in an ABM/LUCC of Agriculture in the Brazilian Amazon. Beyond Zipf: An Agent Based Understanding of City Size Distributions. The Relationship of Dynamic Entropy Maximising and Agent Based Approaches in Urban Modelling. Multi-Agent System Modelling for Urban Systems: The Series of SIMPOP Models. "To sum up, this book is an essential reference for any researcher in the field of ABM and geographical systems. Although a more than 700 pages book can scare everyone, the admirably collective effort to synthesize and provide an up-to-date overview of the most relevant methodological and applied works in the field is worth the challenge. Furthermore, it must be said that it can also be recommended to any reader interested in ABM in general, even if initially unconcerned about geographical applications. Indeed, the first book section covers most of the relevant topics to be considered as a primer in ABM, regardless of the context of application, especially the second ("Principles and Concepts of Agent-Based Modelling") and many chapters of the third part ("Methods, Techniques and Tools for the Design and Construction of Agent-Based Models")." "To conclude, the 37 chapters of this fundamental volume provide a comprehensive perspective of the state of the art in the intensively developing field of modern geographic enquiry to the community of Agent-Based (AB) modelers in geography. I enjoyed reading the book and I am sure it will have an essential influence on the AB modeling community and inspire numerous further developments in the field." "Overall, this edited book provides a comprehensive overview of the emerging area of ABM. Together, the chapters provide a rich source of bibliographic references, detailed illustrations to support visual understanding, and a logical presentation of the science behind ABM. This would make the book useful for a variety of target audiences ranging from established professionals who are interested in the current state of ABM to graduate and undergraduate students who need a systematic introduction to ABM. This book will be an essential reference text for academics, students, and decision makers who design and interpret spatial models to understand geographical processes." Call for papers for the 1st International Workshop on Advances in Computational Social Science in conjunction with 12th International Conference on Computational Science, June 4–6, 2012, Omaha, Nebraska, USA. Advances in computational systems and methods (parallel, distributed, cloud; agents, networks) are revolutionizing how social science research is done. It is now possible to simulate entire cities, for example, in tremendous detail, not only in terms of technical infrastructures like traffic, but also in terms of the social choices of individuals and how these interact with each other to produce complex phenomena. At the same time, advances in informatics infrastructures mean that more data and more detailed data are collected. These data are not just on our physical environment, but are also along social dimensions. The confluence of these two developments open up many possibilities, and social scientists are now probing questions that they could never ask before. Frequently, asking these questions generate even more inquiry into the interfaces between social science, computer science, information science, and engineering. In this workshop, we aim to provide a forum for computational social scientists to share advances made in their respective fields, and the innovations they have developed across disciplinary boundaries: on models, methods, data integration and analysis, as well as interpretation of diverse social phenomena. We also hope to foster an environment for earnest dialogue between social scientists keen to employ sophisticated computational models and methods in their research, and computer/information scientists and engineers interested in understanding social science problems. Computational social science papers that are relevant to this workshop, but cannot be easily classified based on the topics above will also be considered. Papers should be written in English, up to a page limit of 10 pages. The papers should follow the Procedia format, and be submitted electronically through the ICCS submission engine. Please remember to select the workshop ADVANCES IN COMPUTATIONAL SOCIAL SCIENCES in the last field of the submissions page. We ask authors to also send a note to cheongsa@ntu.edu.sg after their submission. All papers will be peer reviewed. Accepted papers will be published by Elsevier in the open-access Procedia Computer Science series. The proceedings will be available at the conference. At least one author of an accepted paper must register for the ICCS 2012 conference to present the paper at the workshop. A selected number of papers will be invited to be extended for inclusion in a special issue of the Journal of Computational Science. GeoMason has recently been updated to support changes to MASON itself and I have contributed a few models to highlight the basic functionality of GeoMason and act as examples for how geographically explicit models can be built. Below are some of the new models that now come with GeoMason. This model demonstrates how one can use GeoMason to explore evacuations from a building. The simulation starts by reading raster data describing a building layout (converted from CAD files). The simulation randomly places a number of agents on walkable areas within side of the building. Once the agents have been placed on the ground, they follow the lowest cost path to the exit (in this example there is only one). The movie below demonstrates how the agents (red dots) move through the space, and through this movement congestion emerges around the exit. The yellow paths are traces of pedestrian moment. Inspired by NetLogo's Grand Canyon Model. The aim of the model is to show how data in the form of a elevation, can be used as a foundation of a simple spatial agent-based model. Similar to the Netlogo model, the elevation data comes from the National Elevation Dataset. 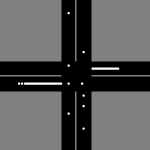 It was converted from an ESRI Grid into an ASCII grid file using ArcGIS. Similar to Sillypeds, the elevation data acts as our terrain, in this case its Crater Lake in Oregon. Agents within the model (in this case water) fall at random over the terrain and then flows downhill over the terrain. If the water cannot flow downhill, it pools up and once the gradient is sufficient, the water flows. For example, water falling in Crater Lake, initially has to pool up until the water level is sufficient to breach the caldera. Once this occurs water flows out of the lake as highlighted in the movie below. This basic traffic model explores how agents travel to Tyson's Corner, Virginia for work. The idea is that if you increased the number of agents (people) more congestion will arise. To some extent this is similar to the GeoMason sim.app.geo.campusworld example.The model demonstrates how you can make agents move along networks (in this case road lines in the form of ESRI shapefiles) from their origin to their destination via a shortest path algorithm. The number of agents is based census tract information i.e. the number of people who work in Tyson's Corner and their corresponding home locations which is restricted to Washington DC, Virginia and Maryland. The movie below shows the fully functional model. In this model we demonstrate how one can use polygons (such as census tracks) to create an abstract Schelling model stylized on Washington DC. The model reads in a ESRI Polygon shapefile and uses attributes of the shapefile to create Red and Blue agents and a number of Unoccupied areas. As with the traditional Schelling model, Red and Blue agents want to be located in neighborhoods were a certain percentage of their neighbors are of the same type. However, instead of using a Moore or Von Neumann which is common practice in cell based models. 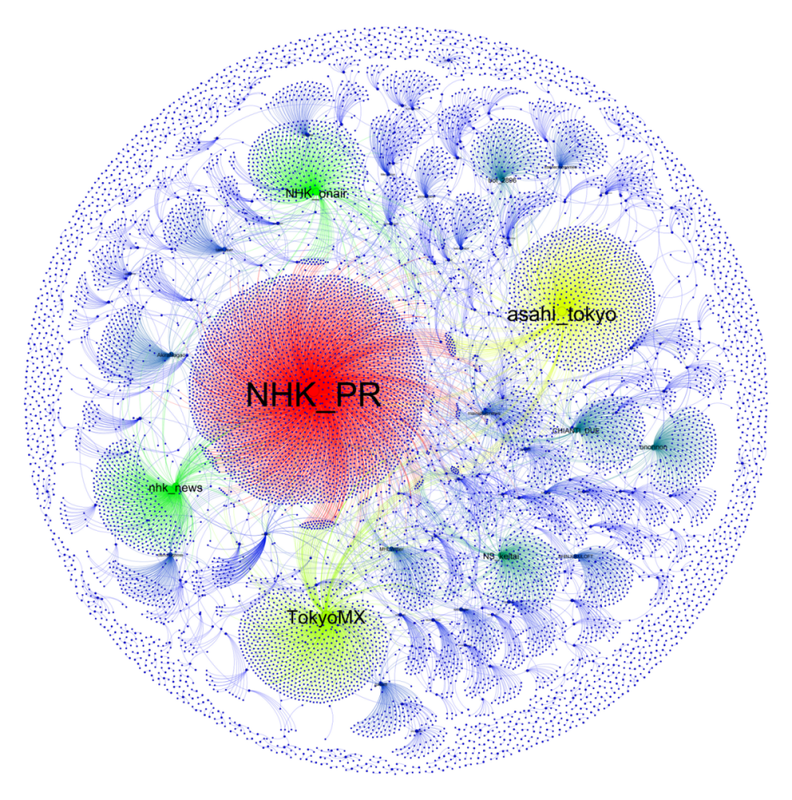 Here neighborhoods are calculated using the neighbors that share a common edge to the agent in question. If an agent is dissatisfied with its current neighborhood, it will move to a random Unoccupied polygon, regardless of whether or not this new location meets its preference. The movie below shows this movement. This model in a sense extends the Schelling Polygon model, however, instead of the polygon being the agent we take attribute data from the polygon model and create individual agents (see Crooks, 2010). This is based on the notion that much of the data we have comes at an aggregate level and often in some sort of vector representation of space such as census data. However, if we want to model the individuals or groups of individuals, we need to disaggregate the data. To do this we create a number of Red and Blue agents based on population counts held within the polygon shapefile. As with the previous model, all agents want to be located in neighborhoods were a certain percentage of their neighbors are of the same type. However, instead of using a Moore or Von Neumann which is common practice in cell based models. Here neighborhoods are calculated using buffer distance from the agent in question. If an agent is dissatisfied with its current neighborhood, it will move to a random location, regardless of whether or not this new location meets its preference. 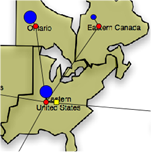 Moreover, the model demonstrates how to link points (agents) to polygons along with some other basic geographical operations (such as union, point in polygon, buffer). The movie below shows this movement both at the individual level and at the aggregate (census track level). This model shows a basic urban growth model based loosely on the SLEUTH model. In the sense, that we have only implemented the four growth rules (spontaneous, new spreading centers, edge and road-influenced growth) and not the self modification element of the SLUETH model. The model demonstrates how different layers (e.g. slope, land use, exclusion, urban extent - urbanized or non-urbanized, transportation, hillshade) can be read into a model to provide cells with multiple values. The movie below shows a specific growth scenario under specific coefficients (parameters) for Santa Fe, New Mexico. More information about GeoMason can be found here along with the source code and data for all the models presented in this post. Alice is a easy to use 3D programming environment where one can create an animation for telling a story or be used for playing an interactive game. It is designed to teach the fundamentals of object-oriented programming. In Alice, people, animals, and vehicles etc are 3D objects that populate a virtual world which one can then animate. What is nice about Alice is its interactive interface, where one can drag and drop graphic tiles to create a program (similar in a way to StarLogo TNG). Below is our (Ernesto Carrella and myself) first brief attempt of modeling agents exiting a room (we quite like the funny walk which reminds us of a John Cleese's silly walks sketch). Another nice feature of Alice is one can import models from Sketchup to Alice, opening up many possibilities, as shown in the movie below. The other day I was teaching a class in the Introduction of Computational Social Science at GMU on complex adaptive systems and I came across the talk below by John Holland and thought it was worth sharing. "The FuturICT flagship proposal intends to unify hundreds of the best scientists in Europe in a 10 year 1 billion EUR program to explore social life on earth and everything it relates to." 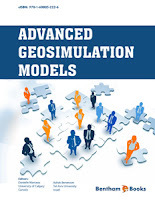 Advanced GeoSimulation Models edited by Danielle Marceau and Itzhak Benenson brings together a number of authors that highlight the the frontier in geosimulation in particular, and in cellular automata and agent-based modelling in general. Click here to see the forward by Mike Batty. We have a chapter in the book entitled "Advances and Techniques for Building 3D Agent-Based Models for Urban Systems" Belwo you can read the abstract of the chapter along with see some of our figures. There is a growing interest in relating agent-based models to real-world locations by combining them with geographical information systems (GIS) which can be seen with the increase of geosimulation models in recent years. This coincides with the proliferation of digital data both in the two and three dimensions allowing one to construct detailed and extensive feature-rich and highly visual 3D city models. This chapter explores some of these developments in relation to our own initial work on building 3D geospatial agent-based models of urban systems and the technologies that allow for such models to be created. These range from coupling agent-based models with 3D visualizati on, to building 3D agent-based models in 3D animation and rendering packages, and to using 3D virtual worlds for the creation of agent-based models. 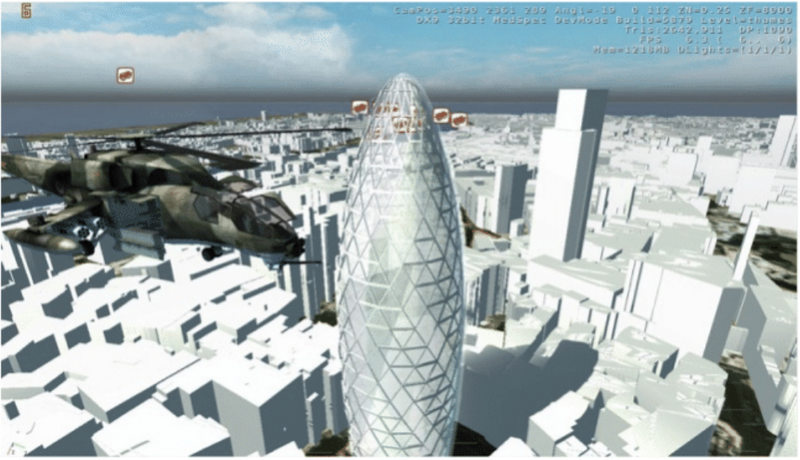 The Swiss Re building and the City of London imported into the Crysis game engine. Why agent-based modeling? In the interview below Doyne Farmer discuses his work with Rob Axtell and John Geanakoplos, who aim to create an agent-based model of the U.S. economy that will people make better understand past, and future, financial crises. But going back to the question above, why agents? to quote from the SFI website: "Whereas a traditional economic model makes future predictions based on past market behavior and thus fails in unprecedented situations, their agent-based model takes into account the actions of individual decision makers, assigning behavioral rules to each agent in the model"